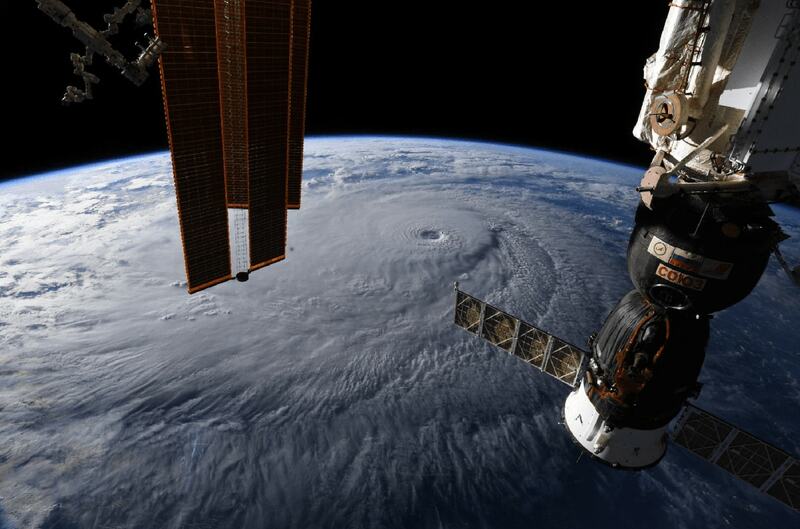 Hurricane Lane, as seen from the International Space Station. Credit: Ricky Arnold/NASA, via Twitter. In the United States, you may think of “hurricane season” mostly in reference to tropical weather in the Atlantic, the Caribbean, and the Gulf of Mexico. Hurricanes, however, can also form in the Pacific—and this week, a combination of unusual weather conditions and bad luck have set a powerful Pacific storm on a collision course with the Hawaiian islands. Hurricane Lane is bringing strong winds and heavy rains to the Aloha State. Rachel Feltman, science editor at Popular Science, joins Ira to talk about the unusual storm, and other stories from the week in science—including research into converting blood to Type O, the changing energy policies of the US, and the tale of an ancient woman with two very different parents. IRA FLATOW: This is Science Friday. I’m Ira Flatow. In the US hurricane season usually refers to tropical weather activity in the Atlantic, the Caribbean, Gulf of Mexico. This week, however, a combination of unusual weather conditions and bad luck have set up a powerful Pacific storm. You’ve heard it. You’ve seen it, Hurricane Lane, bearing down on the Hawaiian Islands bringing strong winds and heavy rains. Although the storm has been downgraded to a category 3 hurricane, parts of the big island have already seen over 30 inches of rain from this storm with more on the way. Joining me to talk about that and other selected short subjects in science is Rachel Feltman, science editor at Popular Science, always welcome. RACHEL FELTMAN: Thank you for having me. IRA FLATOW: You’re welcome. OK. Give us what’s latest on the storm. RACHEL FELTMAN: Yeah. So at least based on the last update I saw, Lane is actually now down to a category 2. And is continuing to downgrade. I think the general thought is that by Friday night, Saturday morning, the worst of it will be over. But the Hawaiian islands are not set up to get hurricanes. They’re just not. And as you said, it’s kind of a combination of weather patterns and bad luck. Why don’t we hear about Pacific hurricanes more? Well, it’s a much bigger ocean, with less coastal land mass than the Atlantic. We really have set ourselves up in North America to just constantly be hit by hurricanes in major metropolitan areas. Not as true in the Pacific. And also, there’s usually kind of an atmospheric pattern that keeps these storms that form around Mexico from making landfall in Hawaii. And that wasn’t as strong this year. Those winds just weren’t blowing the right way. There’s also slightly warmer water than average in Hawaii. And that fuels hurricanes. So a combination of bad luck and weather conditions. There’s a lot of flooding on big island right now. And that rain will probably continue, even after the majority of the storm passes, because it’s moving very slowly. It’s moving about five miles per hour. You remember, we had a similar problem with Harvey in the US, where it was a storm that really just did not want to leave. So even once the worst of it is over, they’re going to keep getting rain. And they’re going to keep getting flooding and landslides. And actually on Maui, where the storm might not even hit directly, they’re seeing such intense winds that there’s a brushfire on West Maui that is being fueled by these hurricane winds. And the rain hasn’t started yet. So they would actually really like the rain to get started on West Maui. So yeah, definitely everybody who lives on Hawaii or is on the islands this weekend, should really listen to emergency warnings and stay safe. RACHEL FELTMAN: Yeah. So the Clean Power Plan got a lot less clean. It was originally set up in 2015 by the Obama administration. And the goal was to lower carbon emissions from the energy sector. Of course, carbon contributes to climate change and also can cause health problems. So the idea was to drop those emissions in the energy sector by 32% by 2030. Trump’s EPA just released their version of the plan, called the Affordable Clean Energy Rule, or ACE. And it’s pretty dirty. It’s only going to lower those emissions by 3% of the target seen by the CPP. Now, the CPP was supposed to lead to $20 billion in climate benefits, $14 to $34 billion in health care savings. And it was supposed to prevent 3,600 premature deaths, I think, annually. In contrast, the Affordable Clean Energy Rule really puts front and center that it’s going to make energy cheaper. But the projections say it will only make energy cheaper by about half a percent. And it’s really just a continuation of this propping up of coal, even though coal is not economically viable. Yeah. IRA FLATOW: The coal companies are out of business. IRA FLATOW: Is it going to increase deaths? RACHEL FELTMAN: Well, it’s not going to decrease deaths, the way the CPP would have. It essentially tells states that they can lower carbon emissions, if they would like to. IRA FLATOW: All right. Let’s move on to more hopeful news. You have a story this week– it was really interesting– about changing blood types. We can change blood types? RACHEL FELTMAN: Yeah. Which I didn’t realize this, but we’ve actually had the power to change blood types for decades. Some researchers figured out how to change type A and B blood into type O blood using an enzyme from coffee beans. You get your blood type based on the antigens on your blood cells, which are either A or B, or you don’t have them at all, which is type O. Those antigens serve as kind of red flags for the immune system. So if an unfamiliar antigen comes in, you’re in trouble. Type O is universal, for most people at least, because it doesn’t have any. So these enzymes are basically like digesting the blood to get rid of those antigens. What’s cool, in this new study, is that they found an enzyme that lives in the human gut microbiome, because they’re similar proteins on the intestinal wall. So they found this bacterial enzyme that is really good at digesting your blood, just enough to turn it into type O. There’s a lot of work to do before this could turn all donor blood universal. For example, they have to prove they can get all the enzyme out, so that it wouldn’t continue to pull antigens from your blood once it was in your body. But it is a really cool finding. IRA FLATOW: Let’s move on to looking up. There’s new evidence of water. I mean, actual clumping of water, on the moon. RACHEL FELTMAN: Yes. So this is the best confirmation yet of ice on the moon. This Indian satellite picked up a bunch of different molecular signatures of water ice at the poles. We’re talking about sitting in the shadows of craters at minus 250 degrees Fahrenheit. So it’s just these little clusters. Yeah. Of course, it’s exciting, because lots of people would like to be able to make rocket fuel on the moon, the idea being that we can use up a bunch of fuel getting out of Earth’s atmosphere, then refuel before heading to Mars. And water is a big part of that. IRA FLATOW: Finally, a tale. This is really interesting, ancient match-up between a Neanderthal and a Denisovan? RACHEL FELTMAN: Yes. So these two ancient species of human that their last common ancestor was 390,000 years ago. And yet, about 90,000 years ago, two of them had a baby. We already knew that these species probably interbred, the same way we know that Neanderthals and our species interbred, based on our DNA. But this is the first time researchers found an individual that looks to have 50-50. They had a Neanderthal mom and a Denisovan dad, which is very cool. IRA FLATOW: That is very cool. IRA FLATOW: Great news stories this week, a lot of them. Thank you. IRA FLATOW: Rachel Feltman, the science editor at Popular Science here in New York.